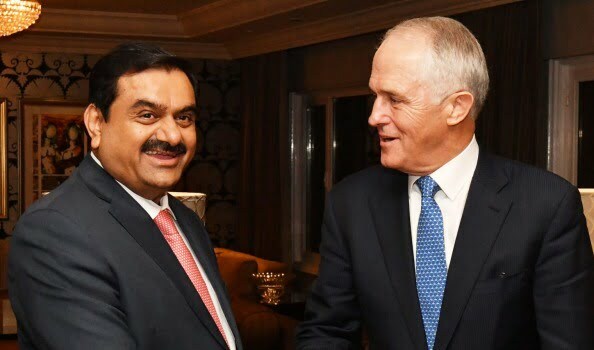 In news hot off the press, Australian PM often dubbed ‘Turncoat’ for his betrayal of Australian democracy is facing his biggest obstacle yet as the Queensland Government refuses to play ball and handle the dirty money on offer to the dirty company Adani. Over to Getup for the update and some more from the Guardian newspaper. The Queensland Government will not hand the $1 billion NAIF loan to Adani. In stunning breaking news, Premier Palaszczuk just announced the Queensland Government will refuse to give the money to Adani. For the loan to go ahead, it has to go via the Queensland Government. Now that Queensland Labor have refused to act as go-between on this dirty deal, Turnbull’s craven billion-dollar payoff to Adani has been left stranded. It’s a massive body blow to Adani, who are now desperately trying to extort handouts from governments as the financial sector abandons them. But things are still so far from over. We know Senator Canavan and his cronies will desperately try to find a way to dish out a billion dollars to Adani. To find every single dirty trick, handout or leg-up they can to give to their best friends. They will continue to throw a tantrum until they get their way. …First we need to take a moment to comprehend the scale of what’s going on. #StopAdani is the biggest environmental campaign seen in this country since the Franklin campaign in the 1980s. It is well-organised, rolling out in communities (there have been 320 events nationally over the past few months, and another 60 are in the calendar). The issue thunders through social media and reverberates through mainstream press coverage. The campaign is also very well-funded. One seasoned environmental campaigner told me this week “there is more money in this campaign than in any campaign I’ve seen, anywhere” and noted it wasn’t entirely clear where the money was coming from. The anti-Adani effort links in to coordinated global efforts by the environment movement to stop new coalmines. #StopAdani (and the associated activities) is the environmental movement’s equivalent of a multinational corporation – with Queensland the local frontline of a global, anti-coal offensive. Whatever the intrinsic policy merits of constraining new coal development to help the world meet its pressing and existential challenge with climate change (and those merits are blindingly obvious to anyone who accepts the science – if you accept the science, a steady transition away from coal isn’t optional) the major parties remain highly sensitised to the fate of the project. There’s the enduring Australian bipartisan tradition: the economic exploitation of resources means local employment and export dollars. And the Carmichael project sits, literally, at the epicentre of the political battle, in a region where disaffection has significantly altered the contours of the political contest. The Coalition and Labor are eyeing off a group of marginal seats in Queensland that could easily decide the outcome of the next federal election. Both are also cognisant of the looming state election campaign. A recent ReachTel poll of 1,600 Queenslanders has the two major parties currently deadlocked 50-50 on the two party preferred measure. On the politics of this development, Labor is caught uncomfortably between its blue-collar constituency and its progressive, inner-urban support base. Federally, it articulates a formulation which attempts to placate both camps: Adani should proceed if it meets all relevant approvals because jobs are good – but not at the expense of the Great Barrier Reef, and it shouldn’t get a cent of taxpayer support. The new Greens campaign, apart from the obvious objective of trying to gain political traction in targeted seats, is about pushing Labor off their hedged formulation into an overtly anti-coal position – which is not a decision the party as a collective is yet ready to take. Triggering that debate is, in fact, a fast train to splitsville. So that’s the challenging state of affairs in progressive politics. Now we need to consider the Coalition. The Turnbull government doesn’t have to straddle the barbed wire fence quite so inelegantly but Adani is causing it grief as well. Government MPs in north Queensland, where regional unemployment is high, are champions of the project. The chief cheerleader of Adani in Canberra is the resources minister, Matt Canavan, who is also responsible for the development of northern Australia. Canavan sometimes does several media interviews a day extolling the benefits of the project, creating an impression the Coalition is monolithic on Adani. Canavan is so assiduous in his occupation of the airwaves you can fail to notice that he, and his party leader Barnaby Joyce, are really the only government people out there consistently banging the Adani drum. In fact if you look and listen closely, apart from a moment of pure, mind-numbing idiocy where the treasurer, Scott Morrison, brandished a lump of coal in the parliament, you’ll notice the Liberal party has dialled the pro-coal rhetoric down in recent months. he rolling civil society campaign against the Adani mine – which includes environment groups and GetUp! – means Liberal MPs are getting regular anti-Adani traffic through their doors and inboxes and social media accounts. MPs around the country are being put on the spot by either GetUp! or local #StopAdani groups who are asking them point-blank whether they support the mine or not. Two Liberal backbenchers have already come out in opposition to the idea that the project will be given a $1bn concessional loan to fund a rail line linking the mine to Abbot Point: Bert Van Manen and Sarah Henderson. Apart from what’s playing on out on the ground, there are other bumps in the Coalition road. Sorry, it’s not currently trending news on the ABC but was covered briefly on the AM radio program.